Editors Note: I was reluctant to publish this, as Council cannot give me any idea of how long the parking periods will be for – none at all. Nor the amount any fines might be. It was fortunate that I had a copy of the original Draft amendments (provided at the end). All a bit of a shell game really, they are shuffling around the areas, but we don’t know what the outcomes are. 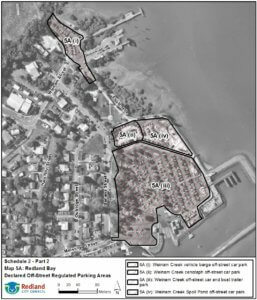 Redland City Council has updated Subordinate Local Law No. 5 (Parking) 2015 to include nine new off-street regulated parking areas and one map amendment. Mayor Karen Williams said the amendments followed community consultation conducted earlier this year. “The amendments to this subordinate local law provide mapping for future regulated parking,” she said. “The amendments incorporate some existing areas that are not currently enforced, but with regulation will provide balanced turnover of car parks around our ferry terminals. 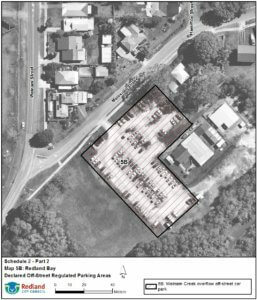 Cr Williams said the regulated parking would not begin immediately and the community would be consulted again before regulated parking came into effect.